As long as the Lord chooses to sustain my funding, and though down it is slowly improving, Apprising Ministries will continue covering and documenting the damage caused by spiritually spineless evanjellyfish’s sordid love affair with the divination of corrupt Contemplative Spirituality/Mysticism (CSM). One of the biggest venues polluting the visible church with spurious CSM is the SBC flagship megachurch Saddleback Church of Protholic PDL Pope Rick Warren, which has become a real spiritual cesspool filled with this rank odiferous skubalon. You can see plenty of evidence for yourself within such AM articles as Rick Warren Ministry Recommends Mantra Centering Prayer and Contemplative Spirituality/Mysticism Invades Evangelicalism With Rick Warren And Kay Warren Leading The Charge and The Daniel Plan Of Rick Warren Encourages “New Age Wacko-ism”. In fact, CSM has ushered in sinful ecumenicism as you’ll see in James Robison And Rick Warren Working To Reverse The Protestant Reformation. Without a doubt one of the leading gurus of CSM, with it form of meditation in an altered state of consciousness commonly referred to by these neo-Gnostics as Contemplative/Centering Prayer (CCP), was Roman Catholic mystic Henri Nouwen (1932-1996). Those words were not written by a Christian because it is a slap in the face of Jesus Christ. It demeans His vicarious penal substitutionary atonement and denigrates God’s Gospel. Jesus Himself told us He was the only way to God the Father. 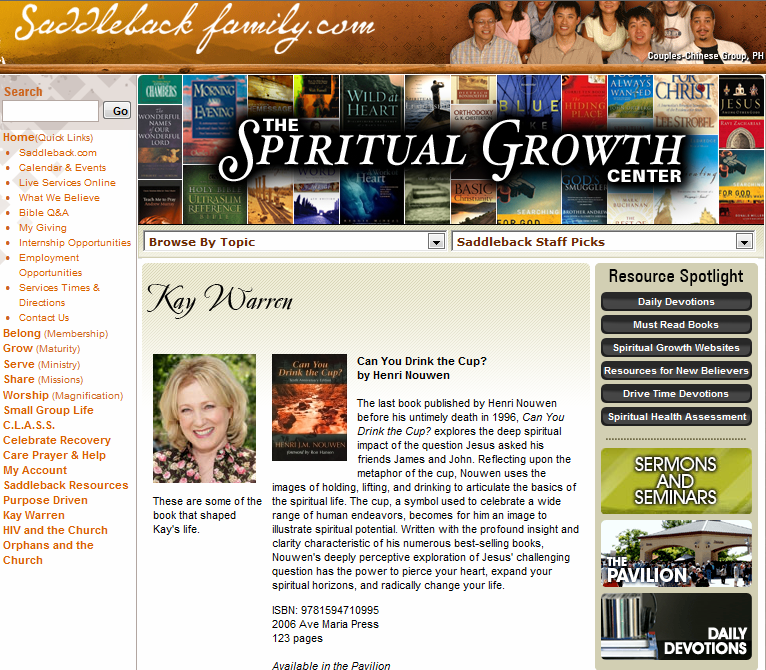 But we’re not surprised to see Kay Warren tweet mythology of mystics as on the Saddleback Church website Saddleback Family, in their Spiritual Growth Center we find a Saddleback Staff Picks section. 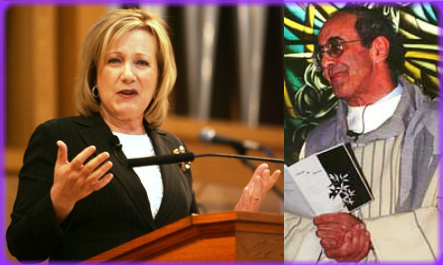 How sad that one of the books “that shaped Kay’s life” was by Roman Catholic universalist Henri Nouwen. Remind me again why, as a former Roman Catholic, I would want to follow the teaching—and practice the mysticism—whose fruit would lead Nouwen into universalism and cause him to die faithfully serving the Roman Catholic Church that has placed its—never changed—anathema upon the very Gospel of Jesus Christ itself. Consider Acts 15:1-2. Henri Nouwen, Sabbatical Journey[New York: The Crossroad Publishing Company], 51, emphasis mine.